For local high school students, it's one of the biggest days of their lives. From where they're headed, to how they feel, to pictures of the big day, 13WMAZ.com is your place to follow local stars on National Signing Day. HOUSTON COUNTY, GA – The Mayor of the City of Perry, Jimmy Faircloth, will visit Bonaire Middle School on Feb. 5, 2014 to speak to students in Family and Consumer Sciences classes from 8:15 until 9:45 a.m. Afterward, Mayor Faircloth will meet with the Family, Career and Community Leaders of America (FCCLA) officers to sign a proclamation for National FCCLA Week. National FCCLA Week is Feb. 9-15, and the month of February is National Career Technical Education. During the week, members plan and carry out activities to address teen and societal concerns and show how Family and Consumer Sciences education can help them achieve leadership experience. Mossy Creek Middle School seventh-grader Keerti Soundappan won second place. The word missed prior to Rebecca being declared the winner was “pitchblende.” Nicole Tayag, an eighth- grader at Bonaire Middle School, won third place. Rebecca and Keerti (pictured from left) will both compete at the District 6 Spelling Bee at Fort Valley State University on Mar. 1, 2014. If for some reason Rebecca or Keerti is unable to compete in the District Bee competition, Nicole will represent her school system. The District Bee winner and runner-up will advance to the GAE State Spelling Bee, which will be held at Georgia State University in Atlanta on Mar. 21, 2014, beginning at 11:00 a.m.
Bibb, staff only on Tuesday. Closed Wednesday. Bleckley, staff only on Tuesday. Closed Wednesday. Houston County Schools are closed Tuesday for staff and students. Dozens of parents filed into Perry High's auditorium to voice their concerns on the board's rezoning proposal. Drivers, don't say you weren't warned. 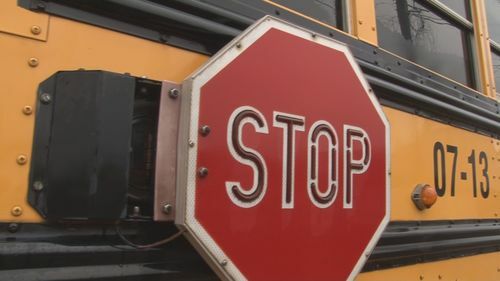 Houston County placed cameras on five buses last year to catch drivers illegally passing them, when stop arms are extended. Transportation Director Tom Walmer says they want to add the cameras to 20 more buses. Bus driver Debra Masa liked the idea from the start. She said, "I was really excited, because I don't want to see any child getting hurt." On her Highway 96 route, she says cars pass the stop arm illegally most everyday; twice Friday morning. Masa said, "Lights were flashing and 55 miles per hour."